You've Lost the Weight. How Soon Before It Comes Back? MONDAY, Jan. 22, 2018 (HealthDay News) — If you’ve just shed a lot of pounds, you might want to hold off on buying a new wardrobe full of “thin” clothes. That’s because new research finds that lost weight starts creeping back almost immediately after a diet stops. “We noticed that individuals transitioned from a weight loss intervention immediately to weight gain,” said Kathryn Ross, of the University of Florida, Gainesville, College of Public Health and Health Professions. It may be that people need a specific maintenance intervention where the focus shifts from how to lose weight to how to maintain that loss. Ross said people also need to understand how challenging the environment is, and how it’s geared to weight gain because of the easy and seemingly endless access to high-calorie foods. People also get a lot of positive reinforcement when they’re losing weight. Family and friends probably comment on what a great job the dieter’s doing. Once weight loss is done, however, no one pats you on the back and says, “Hey, great job maintaining your weight!” said Ross, an assistant professor in the clinical and health psychology department. There are also physiologic and metabolic changes that may make it easier to regain weight if you’re not following some sort of dietary plan, said dietitian Samantha Heller. She’s with NYU Langone Health in New York City. Heller said one way to counteract this is to lose weight slowly, by making healthy changes. The new study included information from 70 overweight or obese adults who completed a 12-week weight management program. The participants lost an average of about 1 pound a week. But once the weight intervention ended, weight regain started almost immediately, the findings showed. Participants gained back about 0.15 pounds a week the first 11 weeks. At approximately 32 weeks from the start of the study, the rate of weight regain slowed slightly, according to the study. Ross said the researchers had expected there would be a longer period of weight maintenance before a regain started. But she added, these findings don’t mean it’s impossible to lose weight and keep it off. In fact, the U.S. government has sponsored a large study of “losers” who have maintained their weight loss. One reason for their success is that they maintain the behavior changes they made when losing weight, Ross noted. 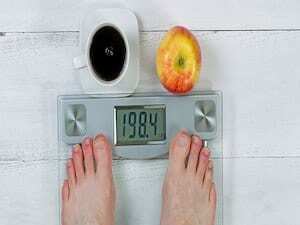 Many weigh themselves daily, which helps to catch a weight regain early. Ross said physical activity is likely an important component in weight maintenance, but people probably need to exercise more than current U.S. guidelines recommend. She said it probably takes about 200 to 300 minutes of activity a week — up to 5 hours — to help with weight management. And, it’s important to realize that when it comes to the environment Americans live in, “we’re really working upstream. It’s easy to spend very little money to get lots of calories,” Ross added. “Our environment makes a big impact. And as much as you can, modify your environment to work for you,” she suggested. For example, Ross bought a house that allows her to bike to work daily, which means she doesn’t even have to think about how she’ll get her daily exercise. As a bonus, she said, her commute on the bike even saves her time over driving. Ross said she had a client who had a lot of trouble driving past a certain donut shop without stopping in — seeing the store triggered cravings. Ross suggested that the client take a different route home so she wasn’t presented with that challenge every day. The study was published online recently in the journal Obesity. The National Weight Control Registry has success stories from dieters who kept the weight off.